St. Theophanes was born in Samothrace, Greece around the year 759. He was orphaned while still a young child, but was left a large inheritance. As a young man, Theophanes' guardian coerced him to marry, however he and his wife vowed themselves to celibacy. They lived together for several years but eventually Theophanes' wife joined a religious community and he became a hermit. 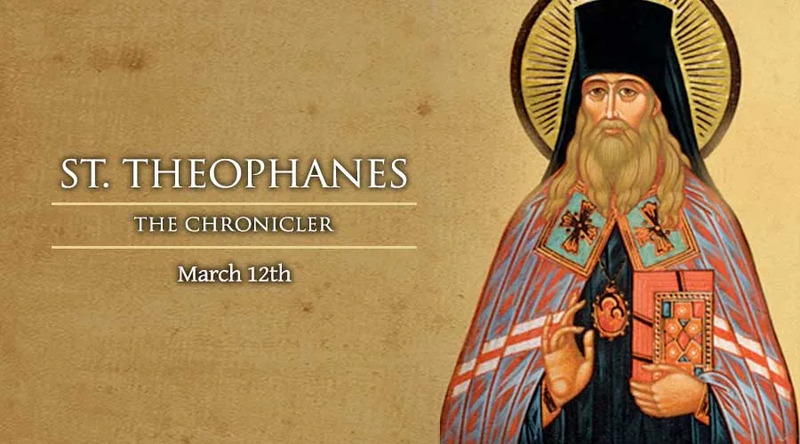 Theophanes' wisdom and holiness were quickly noticed by others. He decided to use his great wealth to form two monasteries out of the men who sought his counsel. Theophanes became abbot of one of these monasteries and gained a greater reputation for his virtues. While he lived in the monastery, Theophanes worked to write a history of the Christian world starting at the end of the Diocletian persecution to the early ninth century. It is for this work that he gained the nickname "Chronicler." During the time Theophanes lived, the iconoclast heresy was causing problems in the Church. The emperor of Constantinople, who encouraged the destruction of icons, tried to gain Theophanes support through subterfuge and coercion but he remained faithful to Rome. Eventually, this fidelity got Theophanes arrested and imprisoned. He died in prison around the year 818.